We only have two more days of being high school seniors! Saturday (graduation) we’ll be considered college freshmen instead. It still hasn’t really sunk in that I won’t be going to my high school anymore- we’ve been over there a bunch of times over the past two weeks for graduation practices and such, not to mention that we’ve been there for classes, activities, and fun events hundreds of times over the past four years. It’s going to be weird next week when all of a sudden we don’t have to go to school anymore. One of the best things about graduation is that it means summer is here! I can’t wait for warm weather, making homemade ice cream, and going to the pool. Another great thing about summer is the amazing produce. Cooking is so much more fun when you have fresh, delicious ingredients to use. If you’re looking for a recipe to kick off the summer, look no further than this refreshing pasta salad. It is a good way to show off fresh tomatoes and cucumbers from your garden (or, in our case, the grocery store!). It was a very nicely composed dish- it had just the right ratio of pasta to dressing to vegetables. It’s also excellent with some sliced grilled chicken on top. We will definitely be making this over and over again because it packs in a lot of vegetables and is truly delicious! I’m convinced lately that I love anything and everything with Greek flavors. In a small bowl, combine the olive oil, lemon juice, shallots, mustard, honey, and a pinch of salt and pepper. Vigorously whisk the dressing until emulsified. You can use an immersion blender or food processor as well. 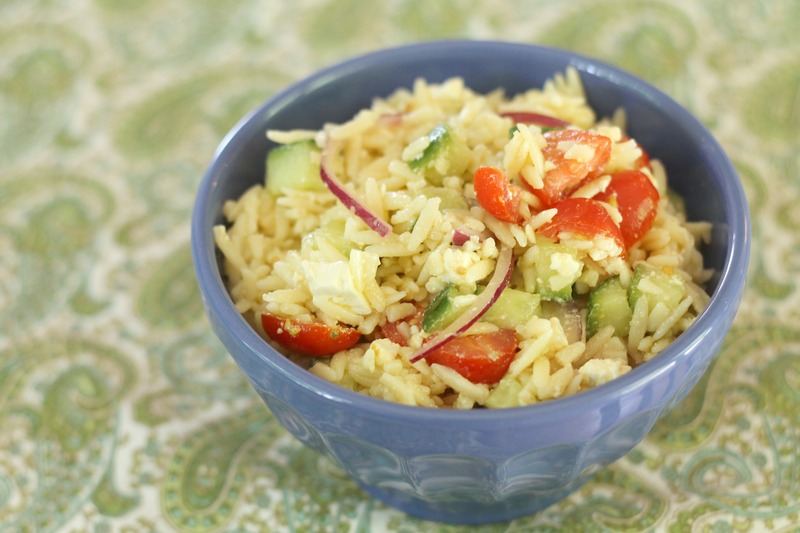 In a large bowl toss together the orzo pasta, cucumber, tomatoes, feta cheese, onion, and fresh basil (if using). Stir in the dressing and season with salt and pepper to taste. Enjoy! This was so good!! Thank you again for all of the delicious food at the party!!! Thanks, Aunt Emily, for the compliment and for your help at the party as well. It was great having all of you! I did not know to rinse the onion to make them mild…good to know! I just learned about it recently, but it’s a great tip. I don’t always love when raw onion is really pungent, so rinsing the slices is a big help!